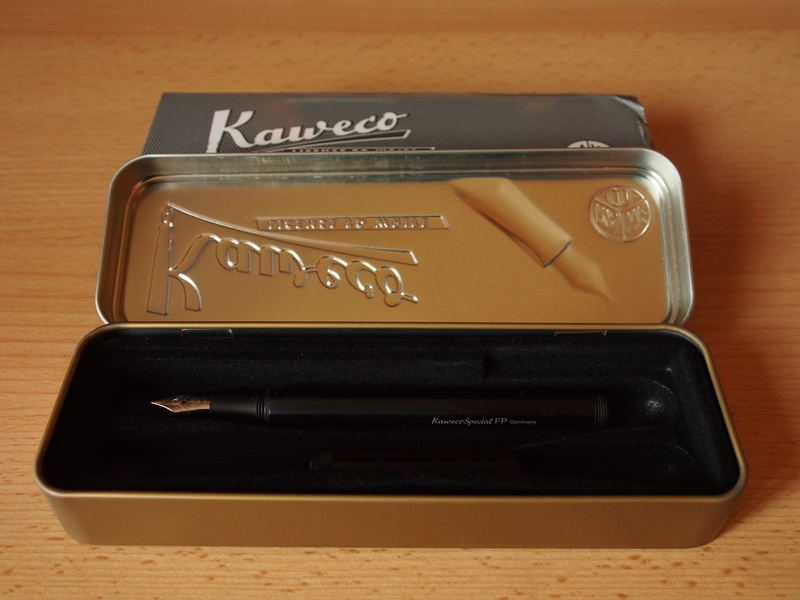 The pen was sent to me by Kaweco for the purposes of this review, and will be returned once the review is completed. I was not paid to write the review. 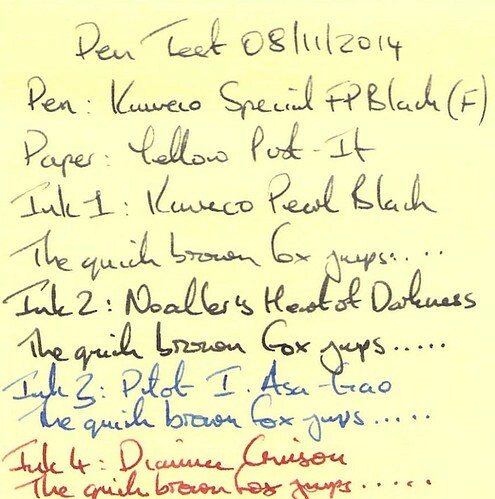 The review itself is my honest assessment of the pen, and is not influenced by the fact it was lent to me. The pen was packed separately from the boxes provided by Kaweco, but for the purposes of the photos I have included the pen to show the relative size. The retro-styled tin box comes in a cardboard sleeve. I have something of an aversion to overly ostentatious packaging which serves as momentary eye candy before being thrown away and I am pleased to say that Kaweco doesn’t fall into that trap. Okay, the tin is metal, but it is small. light and could be used for other purposes. 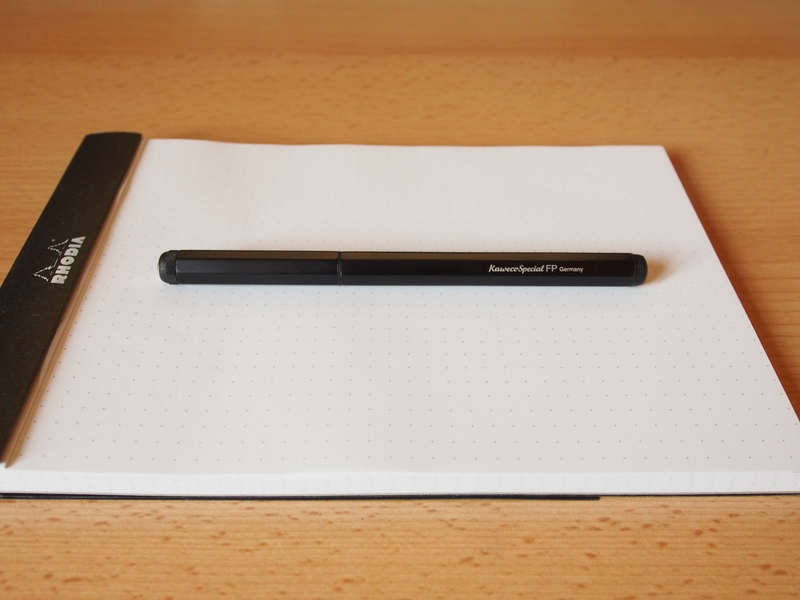 The thin, flexible plastic insert has a velvet-like finish so is unlikely to damage the pen finish in transit. 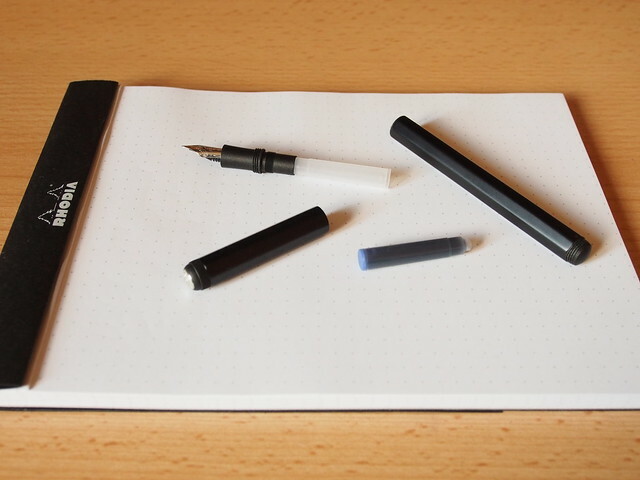 The pen itself is anything but classically styled. 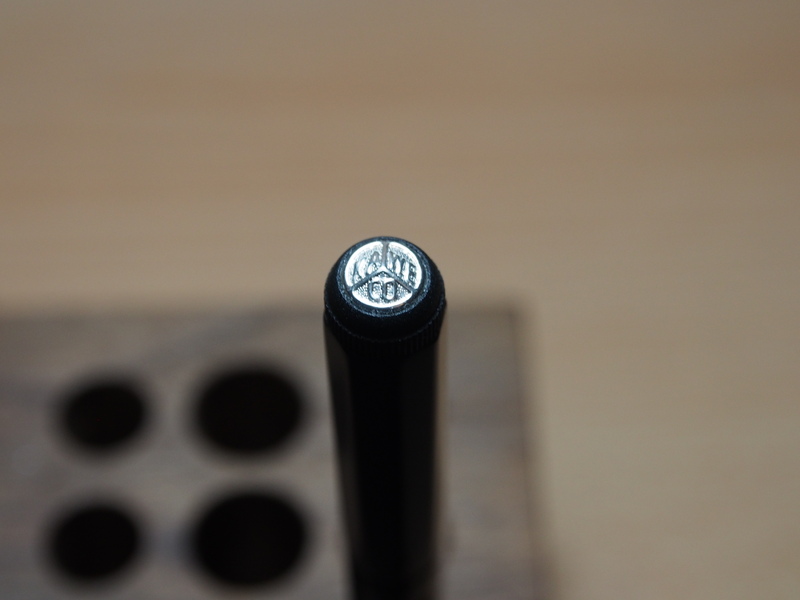 Instead it’s sleek, straight, octagonal and with minimal “furniture” – the only real decorative feature is a silver Kaweco finial on the cap, along with the name of the pen and country of origin on the side. The length and the shape are strongly reminiscent of a lead pencil. The black finish has a some shine, but is not piano black. It does however pick up finger prints and smudges easily. Despite being metal the pen feels light in the hand. The finial is fixed in a roughly finished, knurled setting, which adds to the grip, but the octagonal shape makes that largely redundant. There’s a corresponding threaded end (again with a rough finish) on the opposite end of the pen, which the cap posts to. The first time I tried the screw the cap on, it found it tricky because of the short thread. However, I don’t know if I was just being particularly clumsy on that occasion but it was not a problem that I had again. Once posted the pen is very long, but I didn’t find that to be a problem as it is very well-balanced. The pen is equally comfortable unposted. The pen itself was provided with a short international blue cartridge and an empty cartridge to keep the other cartridge in place. 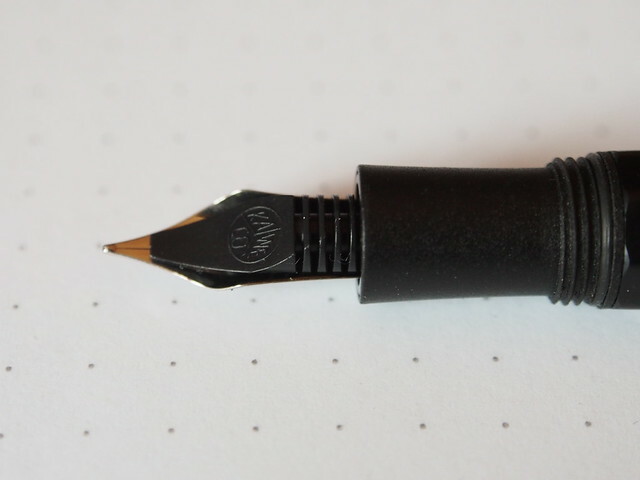 The pen was not supplied with a cartridge convertor – different suppliers in the UK appear to have different policies on whether they include one or not. There’s also an optional pocket clip, which I should have asked to be included. 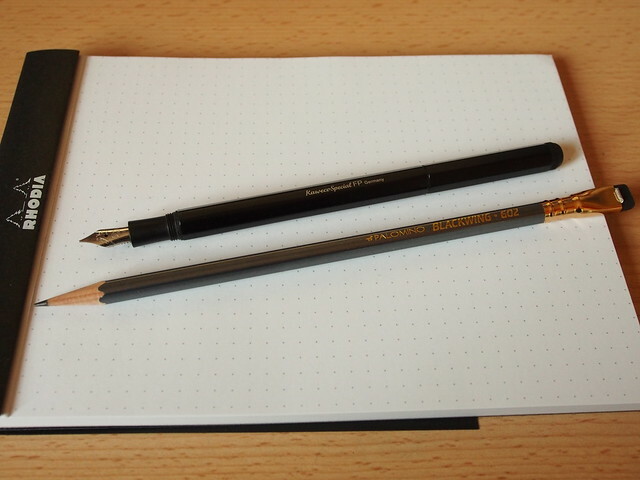 I like to colour match my pens were possible so I would normally use a black ink with a black pen. For black inks I prefer a fine line, but as I have already tried a Kaweco Fine Nib with black inks (with a Kaweco Dia2, which is one of my EDC pens) I thought I would go to the extreme in this case and try an Extra Fine Nib. 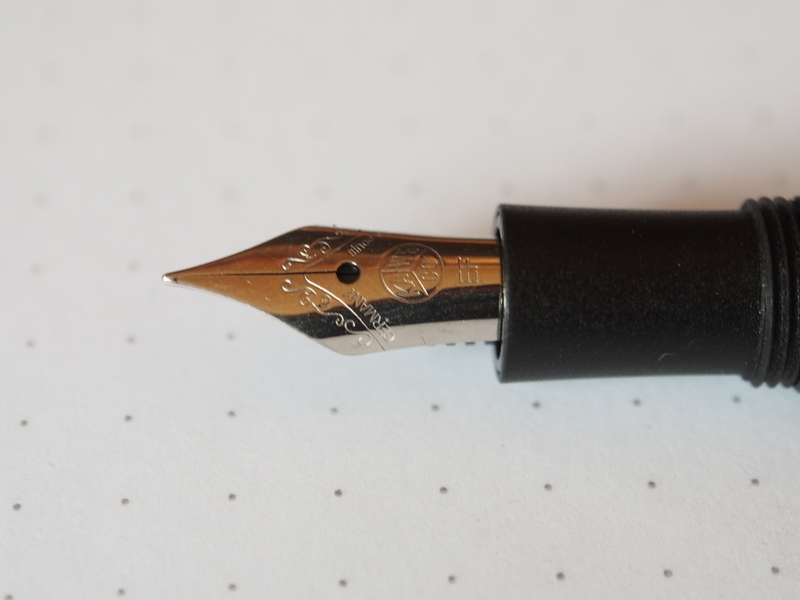 Kaweco nibs are quite small, and sometimes look out of place on their larger pens. In this case the nib looks perfectly in proportion to the pen, and I don’t think a larger nib could even be accommodated without making the cap, and consequently the rest of the pen, wider. 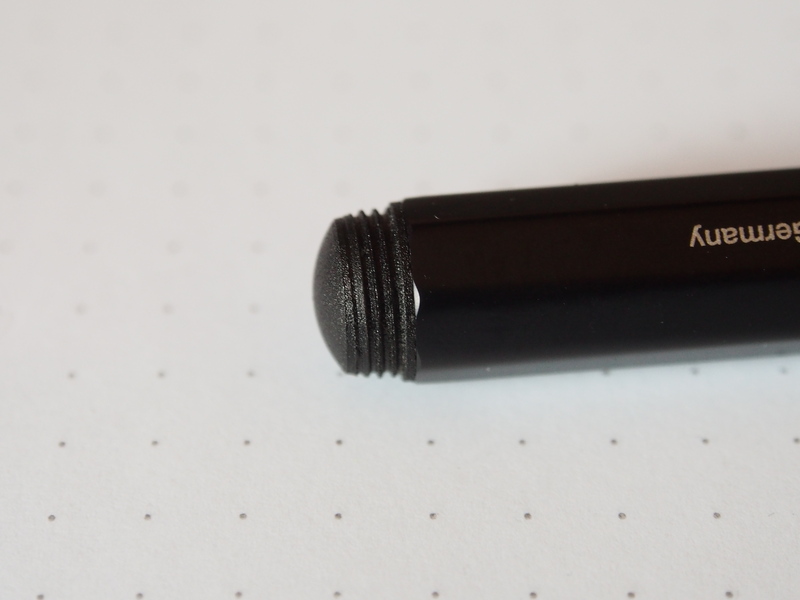 When I first examined the pen I was concerned by the very short grip which meant that the screw thread was right under my fingers and thumb when I tested the grip. I thought this could be uncomfortable when using the pen. However, the fears were unfounded – the threads enhanced the grip and were in no way uncomfortable. 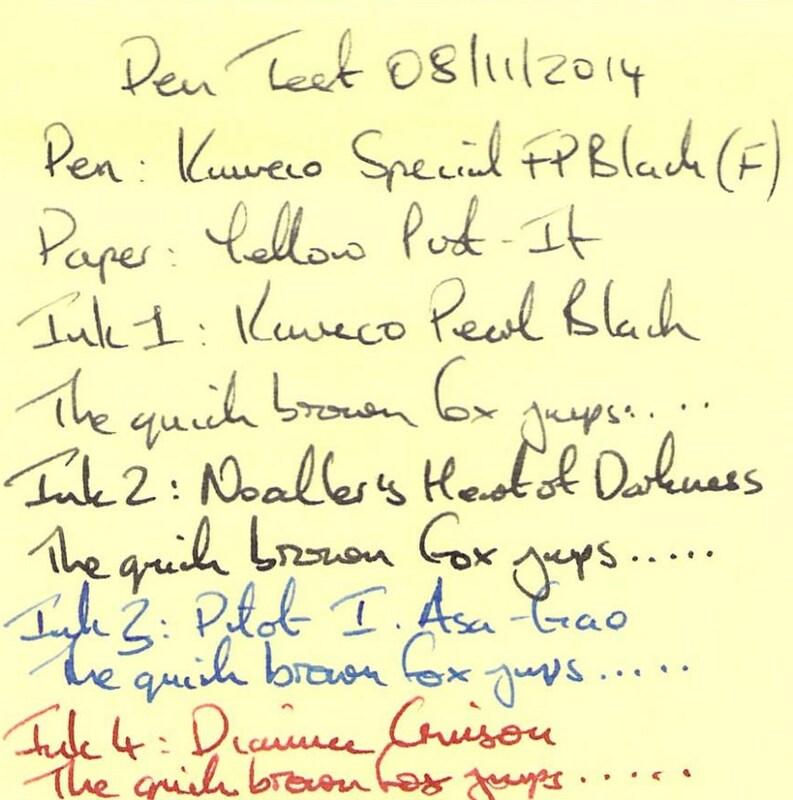 For the purposes of the writing tests I first tried the pen with one of the Pearl Black cartridges provided by Kaweco. 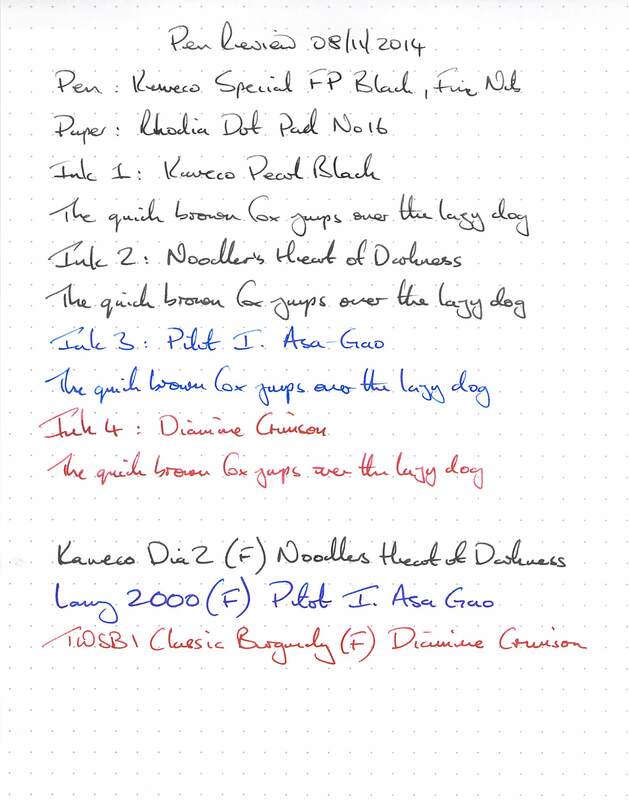 As this would be the first time using this ink, for a more consistent assessment I also tried the inks I usually use in my EDC pens, i.e. 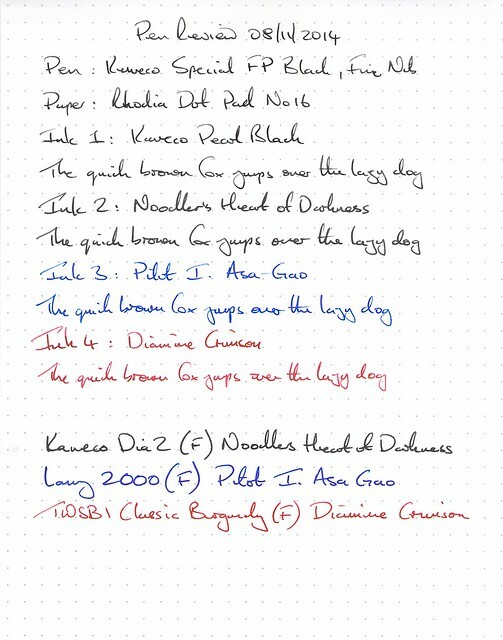 Noodler’s Heart of Darkness, Pilot Iroshizuku Asa Gao and Diamine Crimson. This required the use of a convertor. 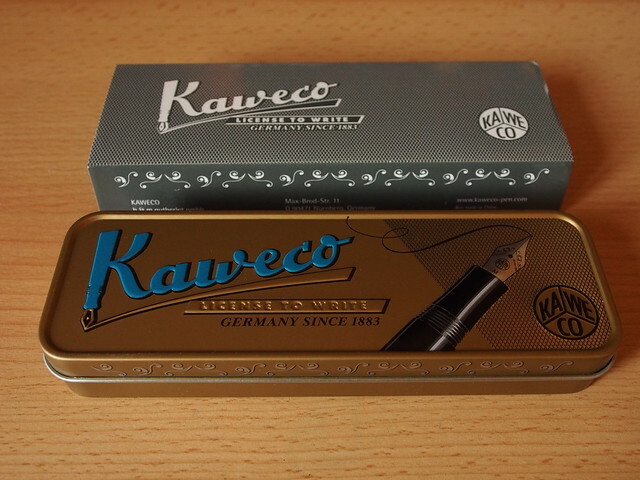 Fortunately I had a Kaweco squeeze convertor to hand which fitted, although a twist convertor would have been better for prolonged use. 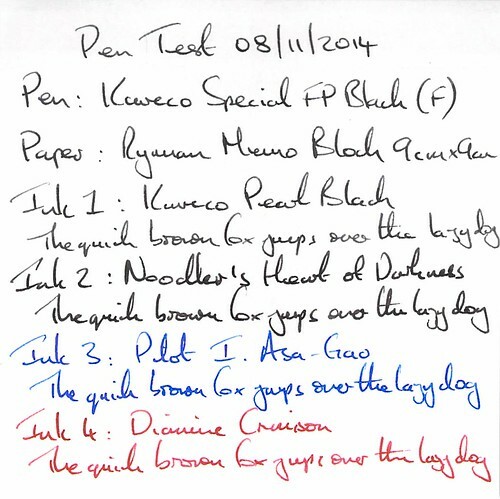 In all the writing tests I found the Kaweco black ink to have more restricted flow that the other inks I tried. 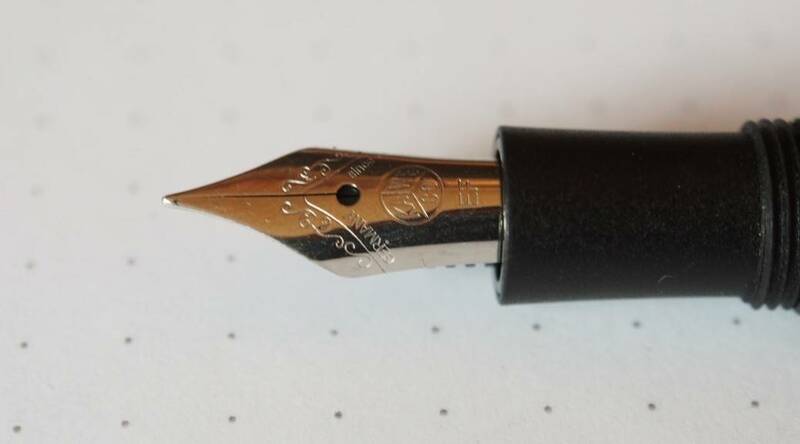 If I had been keeping the pen I would have tried increasing the flow by easing the nib tines slightly, however this is a fine nib, and there is a limit to how much ink such a nib can be expected to put down. None of the writing tests yielded any surprises. 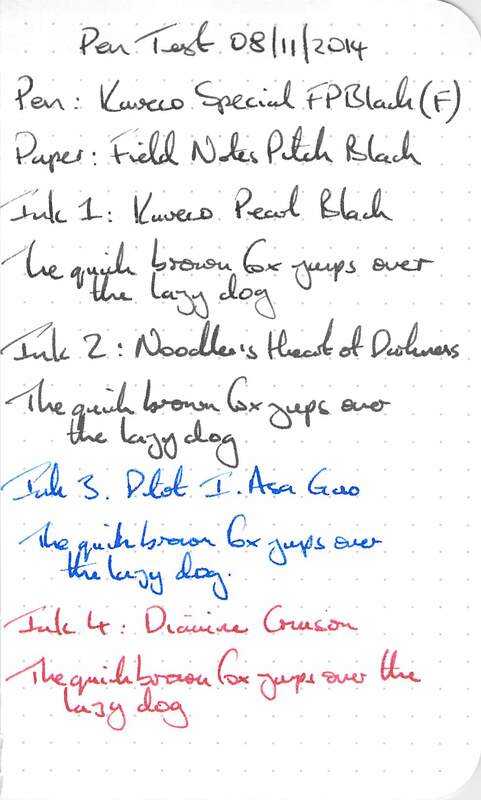 While I am pleased that I tried the fine nib, I think in practice it is a bit too fine for me, even with black inks. 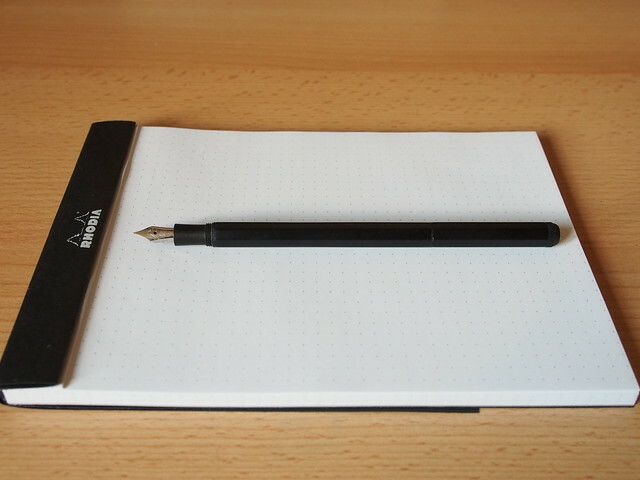 Despite this in all cases the pen performed well on all papers, was comfortable and enjoyable to use. 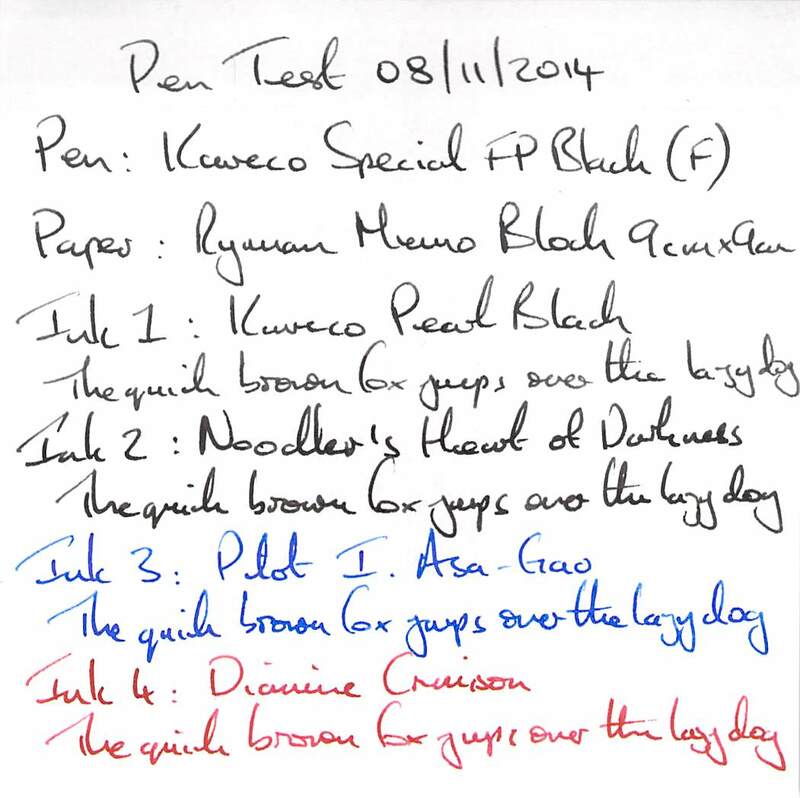 The more free-flowing inks did help the experience. The pen was easy to clean. The nib unit unscrews and the nib and feed are push fit, so the unit can be dismantled if flushing with water isn’t enough to get all the ink out. This is an unusual pen, but it grew on me very quickly. I couldn’t try it with the clip, so I’m not sure how well it would work as a pocket pen. It would however work well as a desk pen. What are my favourite features? The metal construction gives the impression that it would be robust, and the finish doesn’t look like it would scratch easily. The lack of furniture suits the minimalist styling. Is there any thing I don’t particularly like? Nothing I can think of. If I had paid for the pen, would I regret it? In short, no. Now that I’ve tried it, would I buy one? Probably, although there would be a few pens higher up on my wish list and I would want one with a fine nib.